On October 5, 1986 in Nicaragua, a CK123 Cargo plane, with weapons and CIA employees on board crashed. This was the beginning of what links what I am about to tell you together. This was the start of the Iran-Contra affair. It was proven that the weapons were supplied by the CIA and destined for the Nicaraguan Contras in of the Congressional Poland amendments. Special prosecutor Lawrence Walsh spent six years determining who in the Reagan administration was involved in the operation. Among those that were involved in this operation were George Bush, Oliver North, Dewey Clarridge, John Pointdexter and Caspar Weinberger. However, lets go to Mena, Arkansas during this time. The training of pilots and loading of weapons and drugs was taking place. Who was the governor of Arkansas at the time and why is is that Kenneth Starr would not touch this area. That governor at the time is now our President. In July 1994, in the Arkansas Crime Inc. paper, an editorial linked Clinton to Iran-Contra. In October, 1994 Clinton denied any knowledge of the operation at Mena. Shortly afterwards evidence started to surface that documented Clinton’s link to Iran-Contra. People began coming forward and alleging under sworn statements that that Clinton profited from the operation at Mena by laundering money through the newly created Arkansas Development Finance Authority. That was just the tip of the iceberg regarding what was really going on at Mena. A larger number of people testified under oath that the airplanes returning from Central America were loaded with cocaine, which was then dropped over Arkansas for distribution to larger U.S. cities. During 1995, mounting documented evidence continued to support the Mena claims. A KGB spy talks about his knowledge of Mena. The picture of the Mena operation became more clear. In July 1995, new information and evidence confirms drug smuggling is going on at Mena. Why? Because a State Trooper L.D. Brown and a Arkansas National Guardsmen, who were also pilots flying the planes put Clinton in the loop by testifying. In July 1995, Clinton responded to L.D. Brown’s account with denial. We’ve heard that before. In October, 1995 in formal hearings, now a former State Trooper, L.D. Brown elaborates in great detail, on his flights to Central America in the service of the CIA, on Clinton’s link to the CIA. He also details the negative treatment he received from the American press. 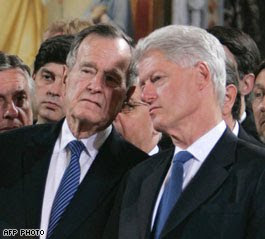 In August, 1996, Noriega attacks George Bush on Contra Drug dealing. And who is Barry Seal? ( read the article by Daniel Hopsicker for Washington Weekly ) How could this go on for years without detection? In February, 1995, the Washington Post is accused of a grand scale political coverup of the Mena affair. However, a statement issued by Arkansas Supreme Court Justice Jim Johnson at this time reveals government efforts to block investigations of the Mena affair and investigations of Clinton’s fraudulent Whitewater loans, and explains how business interests, news media, politicians, and courts in Arkansas manage to block the truth from coming out. Who is Terry Reed? Terry Reed describes how CNN concocted an interview with him, misquoting him all over place. In June, 1995, the Washington Post suppresses another story about the Mena investigations. 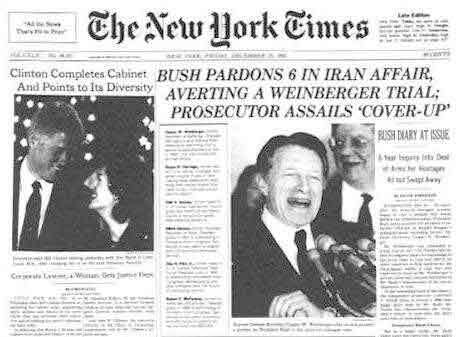 In November, 1996, Caspar Weinberger is accused of participation in the Iran-Contra affair. However, prior to that in December, 1995, documents prove that the U.S. Government pressured Costa Rica to keep the Mena operations secret. Who Is Richard Ben-Veniste? During this time, a Democrat Panel on money laundering, indicts brother of Mike Espy for money laundering. And the State Department accuses Noreiga of taking drug money. This is where Terry Reed comes into the picture I mentioned earlier. Terry Reed testifies. Terry Reed is a pilot and a subcontractor who worked for the CIA Iran-Contra operation. When he discovered that drugs were shipped to the U.S., ( the MENA operators) he left the operation in disgust. He soon found himself and his family the target of a retaliation lawsuit claiming insurance fraud. However, the Reed family was cleared of the allegations in federal court in Wichita, Kansas. Shortly thereafter, the Reed family filed a civil suit against those who had brought the wrongful suit against them. And here folks is where it gets really interesting. Two employees of Bill Clinton, Buddy Young and Tommy Baker were charged with fabrication of evidence and other civil rights violations against the Reed’s. Now this is where is gets even more interesting. In September, 1995 Buddy Young is linked to the Iran-Contra/Mena operation. Clinton’s former security chief, now a defendant in Reed’s Mena trial, appears to have been more involved than previously known. After years of a legal circus, the lawsuit by the Reed family finally began in earnest in late1995. Depositions were taken from a number of people and they all told the same story under oath. They also revealed that U.S. senators (both parties) tried to block investigations into money laundering at Mena. All of these witnesses have sufferedharassment and intimidation because of their explosive testimony. In early 1996, the judge in the case ruled to suppress all evidence relating to Mena, CIA, and the Clintons from the trial. Reed discouraged at this point, gave up and dropped the trial. One honest policeman, Russell Welch supplied much of the material and proof of the Mena case, he too has suffered harassment and intimidation. Who is Julius “Doc” Delaughter. It is December, 1995. Delaughter appears on a British Mena documentary, telling about the whole Mena operation, however it is banned from distribution in the U.S. Remember Barry Seal, ( read the article by Daniel Hopsicker for Washington Weekly ), he comes out of the closet too. Also a certain lady is found in Florida connecting all this. In April, 1996, there is a massive Anthrax poisoning case in Mena and in August, 1996, State Trooper L.D. Brown is ordered to assassinate Terry Reed. And the CIA begins an investigation, (interesting, they are investigating their own operation?) of the Mena operation. The White House is asked about it, and they deny everything. At this same time, Reed drops the lawsuit and the murder of two teenage boys, Don Henry and Kevin Ives occurs in Benton, a town near Mena. Due to persistent parents and a few honest Arkansas policemen, their murders are traced back to the drug smuggling operations at Mena. A British documentary exposes the murders and the link to Mena. No U.S. major news network picks this story up. It is now July, 1996, Kenneth Starr begins asking questions about Mena. He follows the trail of facts, but suddenly announces that Mena is outside his brief and scope of just the Whitewater investigation of Clinton. In the fall of 1995, several committees in the House of Representatives began considering holding hearings about the Mena operation and started interviewing witnesses. To this date, this hearing has never finished and they have not called any more witnesses. ( read the response she received back ) request for hearings to Chairman Henry Hyde. This was September, 1996 folks and to date, nothing has been done regarding this matter. Why? Because I believe this has been the greatest government cover-up that has ever occurred. The reason, both parties are up to their ears with the Mena affair and Clinton. When you contact any of the elected officials about this, they have no comment. I’ve supplied the information to you folks, which I bet you did not know. If you don’t believe me, make a few phone calls to Washington and see how quickly the doors are shut on you concerning the Mena affair. I wonder how many will start to inquire about this with their elected officials? NO ONE WANTS TO TALK ABOUT IT! And why? Both parties have a great deal to hide. And why hasn’t Hyde done anything more about the hearings since 1995? Hoping it will just go away. And Hyde is the current Chairman of the House Judiciary Committee? What I believe is so ironic is we have a President of the United States being investigated, but who is investigating the investigators? Personally, I have lost not only all trust in President Clinton, but also our elected body in Washington. There is more than one politician here that is lieing! We have had not only a witch hunt attacking Clinton, the attackers have a great deal to hide themselves. And I strongly believe that there is more to this whole affair than any of us will ever know. There will be those that will say I am trying to darken the waters, attack Clinton on another issue. That is not the case. I am presenting this to you to show you that we better start asking more questions and not only demanding the answers from our elected officials in Washington but getting them. Who works for whom here? Are they not suppose to be working for us? Sure seem its’ the other way around. Anyway folks, here is it, another shocker! By the way, witnesses have been mysteriously dying off. In the 1980’s, the Mena airport became one of the world’s largest aircraft refurbishing centers, providing services to planes from many countries.Researchers claim that the largest consumers of aircraft refurbishing services are drug smugglers and intelligence agencies involved in covert activities.In fact, residents of Mena, Arkansas, have told reporters that former marine Lt. Colonel Oliver North was a frequent visitor during the 1980’s. Eugene Hasenfus, a pilot who was shot down in a Contra supply plane over Nicaragua in 1986, was also seen in town renting cargo vehicles. 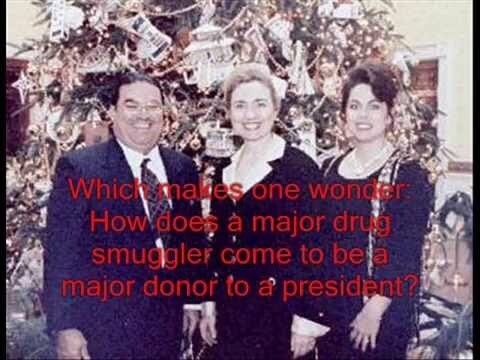 Clinton’s involvement in the drug and arms running goes even further than a mere cover-up of the deplorable activities that went on, and are still going on, at the airport in Mena. A federal mail fraud case against an Arkansas pilot-trainer who participated in illegal arms exports to Central Americarelied on a key Clinton staffer as a chief witness. The case was dismissedfor lack of evidence when the CIA refused to allow the discussion of top secret information about the arms transfers. Shortly afterwards, Reed reported the “theft” of Piper turbo-prop aircraft and he filed a $33,000 claim on which he eventually collected almost $7,000. In late 1985, Reed received a phone call from an Air America buddy, William Cooper, a pilot working with Southern Air Transport, another CIA front company. Cooper also was working with soon to be murdered drug kingpin Barry Seal at the same time he was flying re-supply missions for the Contras. In 1986, he was shot down and killed over Nicaragua along with co-pilot Wallace Sawyer. The plane’s cargo-kicker, Eugene Hasenfus, parachuted into the arms of waiting Sandinista soldiers. Video images of his capture spanned the world and forced an airing of a tiny part of US covert operations. Sandinistas who recovered the downed cargo plane searched Cooper’s pockets and found phone numbers linking the re-supply operation with Felix Rodriguez, an associate of George Bush, best known for murdering Che Guevara after his capture in Bolivia. To this day, Rodriguez, who works for the CIA, wears Che’s watch as a trophy. Meanwhile, Reed went into business in Mexico with the blessing of Rodriguez, who was overseeing the Contra air re-supply operation in El Salvador. Reed’s company used Mexico to export arms to the Contras, in violation of the Boland Amendment. Reed went down to Mexico and his operation continued for a year after the Iran-Contra story broke. According to Arkansas Committee researcher Mark Swaney, in the summer of 1987, even as the ContraGate hearings were going on in Congress, Terry Reed began to suspect they were using his front company for something other than smuggling weapons. One day, he was looking for a lathe in one of his warehouses near the airport in Guadalajara and he opened up one of the very large air freight shipping containers (they are about 28′ long, about 7′ high and about 8′ wide), and he found it packed full of cocaine. Swaney reports that Reed realized he was in a very precarious situation because he was the only person on paper who had anything to do with the company set up to run guns to the Contras in Nicaragua out of Mexico and there was nobody to say that he did not know anything about what was going on. Reed decided he wasn’t going to play the part of a patsy. Swaney says that Reed’s contact man for the CIA in Mexico was Felix Rodriguez, whom Reed confronted. Reed said that he hadn’t bargained for getting into narcotics smuggling and that he was dropping out all together. Soon afterward, his legal problems began. In a series of mysterious events, Reed was charged with mail fraud for claiming insurance for an aircraft that was used by North’s network under Operation Donation. Reed, who was eventually acquitted of the charges, was picked up by the FBI after the missing plane was discovered in the Mena hanger where Reed had put the plane at Cooper’s suggestion. The discovery was made by Clinton’s security chief Buddy Young. Young testified that his discovery of the stolen plane was coincidental, an assertion federal Judge Frank Thiel said was unsupported by the facts. Reed was charged with mail fraud for collecting insurance on the plane, but the CIA prevented prosecutors from releasing information they called “top, top secret,” about the Rodriguez-North, Southern Air Transport connection. In November 1990, the prosecution admitted they couldn’t prosecute Reed without the secret documents and Judge Thiel ordered Reed acquitted on all of the charges. Allegations of Governor Bill Clinton’s extra-marital sexual exploits originated with a 1990 lawsuit by Larry Nichols, a former Arkansas state employee. Nichols was fired by Clinton in 1988 after reporters discovered Nichols had been lobbying on behalf of the Contras from his office as head of the Arkansas Development Finance Authority. The suit claimed that Clinton had lied when he said Nichols was fired because he was phoning the Contras directly from his state office. Nichols claimed he only called Washington to lobby on behalf of the Contras. In the suit, Nichols also revealed the affair between Clinton and office secretary Gennifer Flowers. The suit was dropped by Nichols on January 25, 1992, after Gennifer Flowers went public with her story of the affair. Nichols told reporters that he decided to drop the suit after meeting with Clinton security chief Buddy Young- the same man who found Terry Reed’s missing Piper aircraft at the Mena airport. In court documents recently released by Manhattan District Attorney Robert Morgenthau, it has been revealed that Jackson Stephens, a billionaire banker in Little Rock, Arkansas, and one of presidential candidate Bill Clinton’s main supporters, may have played a key role in setting up the illegal purchase by the Bank of Credit and Commerce International (BCCI) of two American banks. Both First American National Bank, the largest bank in Washington DC, and Georgia National Bank, were purchased by BCCI front man and Stephens business associate Gaith Pharon. Stephens’ family bank, the Worthern National Bank,recently extended a two million dollar loan to the Clinton campaign. Stephens, who is an avid golfer and chairman of the prestigious Masters Tournament Committee, is named in the court records as having brought Pharon together with Stephens’ close friend Bert Lance. Lance was a former cabinet official under President Jimmy Carter who was forced to resign due to a banking scandal. According to newspaper reports, BCCI founder Agha Hasan Abedi was introduced to Lance by Stephens. Stephens, Lance, and First American Bank director and longtime Democratic party power broker Clark Clifford all maintain that they did not know the group of Pakinstani and Saudi investors headed by Pharon, which they were dealing with, were actually fronting for BCCI. Clinton’s staff has refused to comment. Bill Clinton’s environmental record has been as dismal as his record in the Iran-Contra scandal. He has supported the incineration of extremely toxic chemicals at a site in the city of Jacksonville, 20 miles from Little Rock, that is reputed to be the most polluted spot in the United States. Jacksonville was the site of Hercules Inc., a company that produced the two components of Agent Orange, 2,4 D, which is still used in agriculture and 2,4,5,T, which was banned by the federal government in 1983 as a carcinogen. Agent Orange was used to defoliate Vietnamese forests during the Indochina war and its production yields the by- product dioxin, the most toxic chemical known on earth. Hercules sold the operation in 1976 to Vertac Inc., which closed the plant in 1987, leaving behind 20,000 barrels of the chemicals. Gov. Bill Clinton supports a plan to incinerate the waste, a plan that is being vigorously opposed by the residents of Jacksonville.